Wholesale Water Treatment Equipment & Supplies - Robert B. Hill Co.
At the Robert B. Hill Co., we have a strong team that is ready to assist our wholesale customers. Our wholesale department was developed to provide quality products and technical support to water treatment manufacturers and dealers. We provide residential, commercial, and industrial components as well as complete systems. We have a full line of inventory that is available to ship. We stock bulk media such as resin, garnet, anthracite, carbon, gravel, birm, greensand, greensand plus and many other types of media. From our office staff to our production team, you will not find anyone else that is more dedicated to solving your needs. We have a large warehouse that consists of: steel pressure vessels of all sizes, fiberglass pressure vessels of all sizes, Fleck valves, Autotrol valves, Millenium valves, Clack valves, Wavecyber pressure vessels, Structural pressure vessels, Dow resin, Purolite resin, Rohm & Haas resin, Calgon carbon, reverse osmosis components, Aquamatic diaphragm valves and stagers, Seametrics, Mattson Witt, brine tanks, Fleck parts, Autotrol parts, Clack parts, cation resins, anion resins, specialty resins, membranes, cartridge filters, and many other products. Contact our wholesale department today for your specific needs. Also, don’t forget to ask about being a Robert B. Hill Co. dealer. There are many benefits of becoming a dealer, such as technical support, training, access to special pricing and products, inventory forecasting to make sure your products are always in stock, advertising literature, product manuals, and many other benefits. Pressure vessels or mineral tanks are manufactured in a variety of sizes and materials. 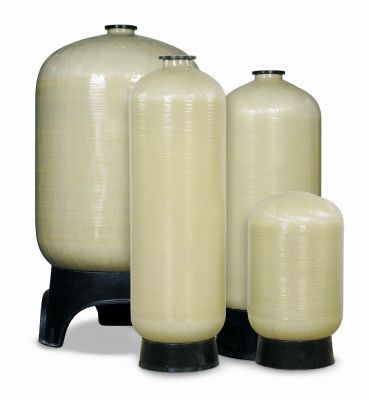 Fiberglass pressure vessels are some of the most common pieces of equipment manufactured today. 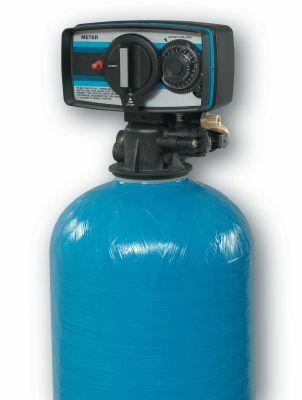 Many commercial applications use fiberglass pressure vessels. Examples include car washes, hotels, apartment complexes, schools, manufacturing facilities and many others. For industrial applications and commercial applications that require higher flow rates, steel pressure vessels are used. Steel pressure vessels allow for a greater flexibility in design. 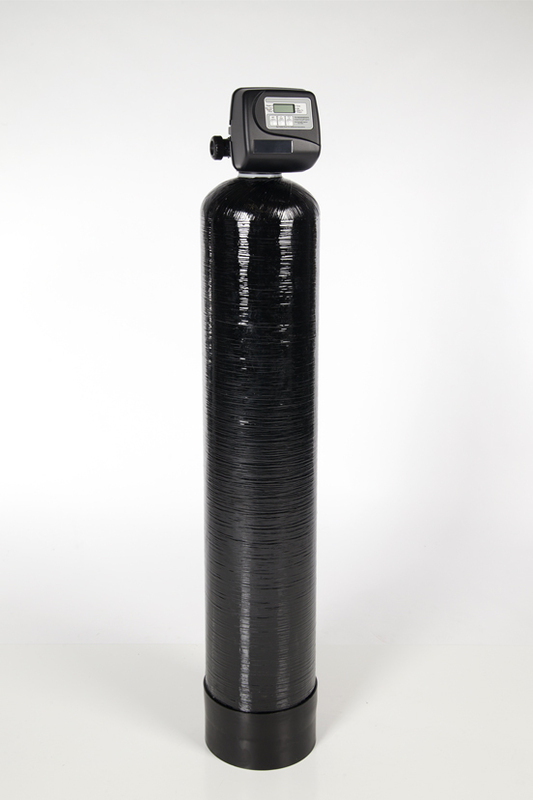 The two major manufacturers of fiberglass pressure vessels are Wave Cyber and Structural Fibers. Wave Cyber is distributed by Clack Corporation out of Wisconsin and Structural Fiber mineral tanks are manufactured by Pentair in Chardon, Ohio. The vessels start at 6 inch diameter and max out at 63 inch diameter. They are manufactured in several tank opening configurations, 2.5” threaded top, 4” threaded top, 6” flanged top, and 6” flanged top and bottom. The fiberglass tanks are made in a wide variety of colors such as natural, black, blue, gray, and almond. Using steel pressure vessels allows for a greater flexibility in design and flow rate. Many industrial water treatment equipment applications such as industrial water softeners, filtration, iron filtration, deionization, dealkalizers, and ion exchange use steel pressure vessels. These vessels are used in markets such as refineries, power & steam generation, food processing, chemical processing, industrial manufacturing, medical, laundry facilities, pharmaceuticals, government, municipal, agriculture, mining, metal plating, resorts, institutional, and portable water facilities. The steel vessels allow for much larger diameters than fiberglass pressure vessels. Over 63 inch in diameter, steel pressure vessels are the only option. They can be manufactured to your exact specification. Man ways, hand holes, pressure relief flanges, air scour openings, and any other option can be custom made. Typically industrial design will use steel pressure vessels along with valve nests. 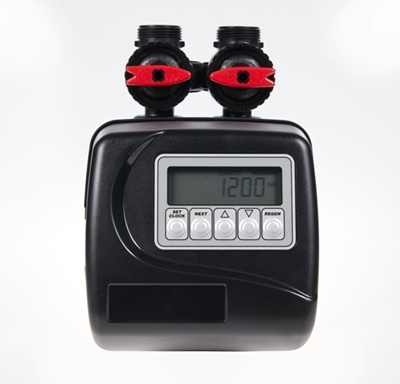 Valve nest allow for air actuated valves with low Cv (flow rate at 1 psi loss) and high operating cycles. 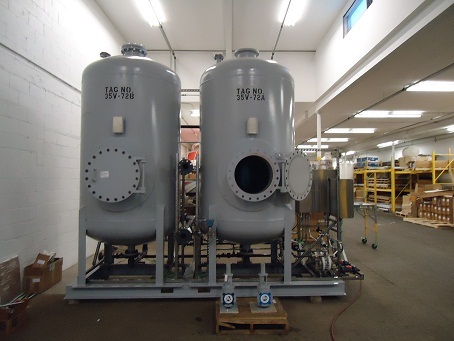 The vessels can be designed for much greater pressures than fiberglass pressure vessels as well as the fact that they can be designed with a wide range of exterior paints and interior linings. An example of a custom interior lining is rubber coating to allow for chemical resistance. The design of the pressure vessels is a major factor in creating a superior product. These vessels must be applied properly as to design for the maximum life span possible of the industrial water treatment equipment and commercial water treatment equipment. The flow rate and media holding capacity are essential to the design as well. Without the proper vessel design many clients are required to tear out existing equipment prematurely and install new equipment. This can be avoided by starting with the correct pressure vessel design the first time.